On the eve of the Commonwealth Games, India's champion swimmer Rehan Poncha tells Harish Kotian he's getting better with each swim. 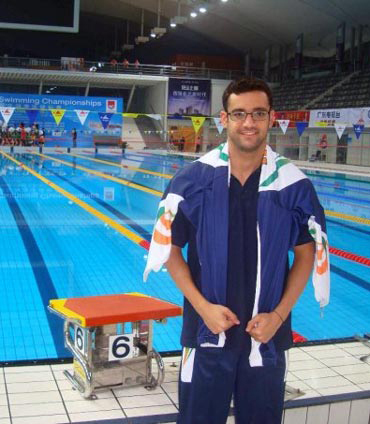 Fresh from a training stint in the United States, India's ace swimmer Rehan Poncha is raring to go at the Delhi Commonwealth Games. "I am confident of a good showing in the Commonwealth Games. I have trained and I am swimming well. I believe I am getting better with each swim. I have never trained so hard in my life before. It was very strenuous but I gave it my all because I want to do well in the Commonwealth Games," Poncha told rediff.com at the Games Village. "I've never been so well-prepared or never trained so hard for any event before this in my life. I am excited to race in Delhi. I don't take it as pressure, because the josh of racing is there inside me and I am looking to do well." 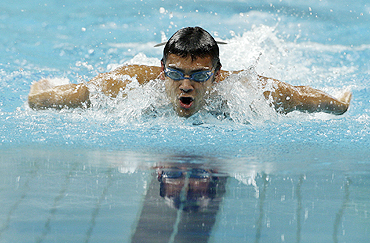 Rehan is the most successful Indian swimmer, having won three senior national titles and over 25 international medals. India has never won a medal in swimming at the Commonwealth Games and it is a jinx Poncha is hoping India can break this time. "We are performing in front of our home fans, so that will be extra motivation for us to do well. I am just raring to have a go. The timings that I registered in some of the sessions during my training were excellent. That has given me a lift." "I underwent a five-month training stint in the US under coach David Salo. Basically, I trained for butterfly, individual medley, my turns, underwater components and many other things. "I always have been a swimmer who had endurance but lacked power, so we worked a lot on areas like those. I need a two-second drop from my previous showing and I should make it to the final and from thereon anything can happen," the 24-year-old added. Poncha said he is looking to compete in five or six events but that is yet to be confirmed by the coach. 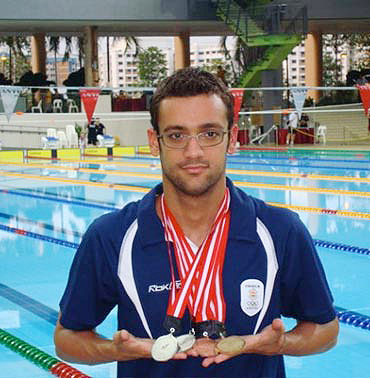 The events he is planning to take part are the 200 metres butterfly and backstroke, 200m and 400m individual medley and the relays. Taking about India's medal chances, he said: "India has never won medals in the Commonwealth Games, but this time I think we have our best chance. "India's level of swimming has improved in the last few years. A few of them will definitely make it to the finals but can't guarantee medals. We have Australian, South Africa and England, who are the top nations in the world in swimming. They have world record holders and they would cover the first three medals. So we will have to look for a top six finish, which I believe we never had, at least in the last 15 years. "As a team, and personally, we have prepared to the best of our ability; there is additional motivation for me since we will be performing in front of the home crowd. We don't want to disappoint our fans," said Poncha, who was conferred the Arjuna Award in August.